Reservations at the JASNA conference rate may be made now by clicking on this link, or by calling 1-888-421-1442. If you phone, ask for the conference rate for the Jane Austen Society of North America (JASNA). The group rate is available until September 4, 2017, or until the room block sells out. 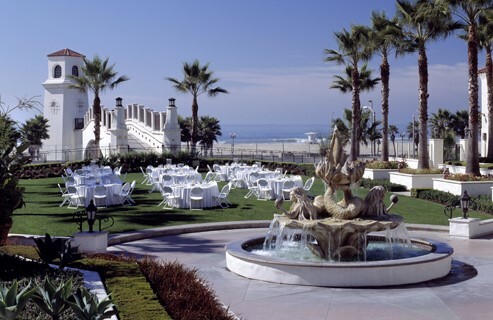 Mrs. Bennet would have been in raptures in the celestial splendor of the Hyatt Regency Huntington Beach Resort and Spa. Described as “Heaven on Earth Beauty” by one enthusiastic TripAdvisor reviewer, the hotel is located directly on Pacific Coast Highway, built on a slight rise, so that the blue Pacific is all you see. The substantial grounds are punctuated with Spanish-style fountains, coastal landscaping and several pool areas. 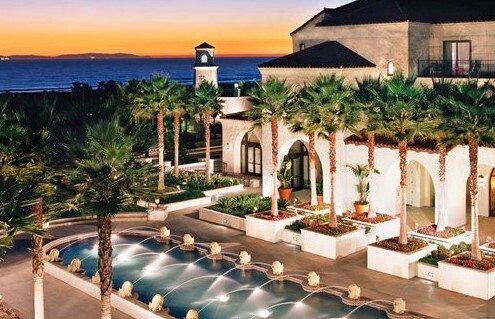 There are 517 guest rooms, many with breathtaking ocean views. Digging your toes in the sand is just a short stroll away, across an over-highway bridge. Hotel staff provides you towels and chairs as you descend onto the beach. Choose from several dining options on the hotel premises. Watertable offers fresh contemporary American fare with artisanal cocktails and an incredible breakfast/brunch menu. Pete’s Sunset Grill is a casual restaurant offering burgers, pizza and pasta. Within easy walking distance is the new Pacific City complex, a mix of dining, shopping and entertainment venues that reflects the modern “artisanal marketplace” emerging in many American cities. The hotel is just a few blocks from Huntington Beach’s Main Street. Guests may stroll along the beach, or for a minimal charge take a shuttle to the pier. This casual and al fresco downtown area is alive with cafes, restaurants, apparel, jewelry and surf shops. Browse the wonderful International Surfing Museum and get a thorough understanding of why the sport permeates the city’s culture. When reserving a room, be sure to specify your preference for a king bed or two queen beds. Some Kings are available with extra roll-away beds for a $25 per night charge. Deluxe King rooms have pull-out couches for triple or quadruple occupancy. The special convention room rate extends from Tuesday night through the following Monday night, so that you may extend your visit to southern California, until the room block has been sold out. The hotel charges a mandatory Resort Services Fee (discounted to $10 daily for rooms in the JASNA block) which provides high-speed internet, bottled water, and access to the luxurious Pacific Waters Spa. Reservations made through iPads or phones, instead of desktop or laptop computers, occasionally experience problems. Confirmation notices will be sent through email by the Hyatt Regency. Be certain that your email provider settings are set to allow receipt of this email. Add groupcampaigns@pkghlrss.com to your safe list. Check all your incoming mail folders, not just your Inbox, for notices from the hotel. For example, check “Junk” if your provider is Hotmail.com, “Spam” if your provider is Yahoo!, etc. Based on experience at past AGMs, the room block may sell out in advance of the opening of AGM registration, but some rooms usually become available due to turnover throughout the summer and early fall. IMPORTANT: Please cancel your room reservation as soon as possible if you are unable to register for the JASNA AGM or must cancel at a later date.